Image Credit: Photo taken in Seoul by the author. The relationship between Japan and South Korea has been uncooperative this week, with both sides again raising issues that traditionally fuel nationalist sentiments with their respective publics. Earlier this week, South Korea warned that a Japanese review of the 1993 Kono statement, which apologized for Imperial Japan’s use of comfort women during the Second World War, would cause Seoul to retaliate. On Thursday, the Japanese government protested South Korea’s plans to conduct a live-fire drill off near the Dokdo/Takeshima Islands, which the two countries currently dispute. While both Japan and South Korea have a strategic interest in the islands, due to fishing rights and the prospect of developing nearby natural resources, the Koreans are much more vocal in their assertions. As The Diplomat has pointed out before, many Koreans think that even acknowledging Japanese claims to the islands might possibly give them validity, and losing them could legitimize part of Japan’s colonial rule. 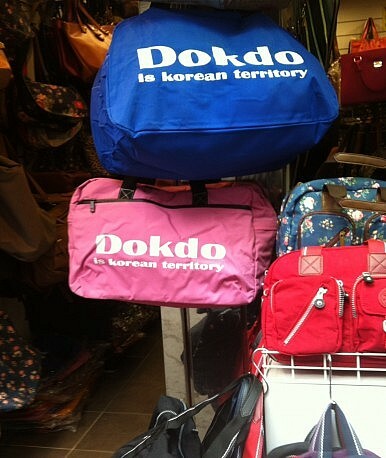 This is partly why you see things such as scale models of the islands explaining Korea’s sovereignty over Dokdo/Takeshima in Seoul’s subway stations, and vendors at major outdoor markets selling bags with “Dokdo is Korean Territory” emblazoned across them. Japan has said it will not retract its apology from 1993, and South Korea’s contact of the Japanese Coast Guard well in advance of its drills shows it does not wish conflict either. However, Japan is questioning whether South Korea unduly pressured the Kano government to admit to actively promoting the use of comfort women, and Seoul’s naval drill is large enough that the Japanese Coast Guard has had to issue its first ever warning to ships in what it considers are Japanese waters, due to a Korean exercise. This tendency to maintain a nationalist tension by both countries comes as their ally, the U.S., is seeking to “deepen trilateral security cooperation and interoperability” between the three countries, according to statements made by National Security Advisor Susan Rice on June 11. This was after U.S. President Barack Obama brought together Japanese Prime Minister Shinzo Abe and South Korean President Park Geun-hye on the sidelines of a Nuclear Security Summit in March to discuss regional security. While Japan and South Korea both have an interest in cooperating to reduce the threat of North Korean nuclear and ballistic missile tests, they continue to let nationalist sentiment inhibit progress toward shared goals.